In fact, power companies every year emit so much carbon dioxide, it's as though there were over 489,000,000 more average passenger cars on the road. and how much global warming pollution is emitted to meet the needs of the average customer. 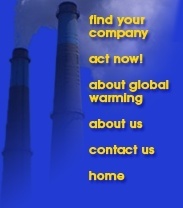 Write to your Senators and urge them to work to the get global warming problem under control. 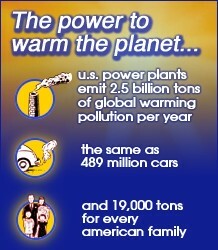 Global warming is being brought to you by America's power companies. Join the effort to hold your power company accountable.